But rest assured: These 21st-century Huns come in peace, bearing gifts no less. The latest addition is GiYan, a cosy one-room bar located on the eighth floor of a backstreet office building. It’s not the easiest to find (look for a red lantern! ), but once inside, you are treated like family. Though the décor resembles something like a Mongolian tourist center, it adds to GiYan’s charm. 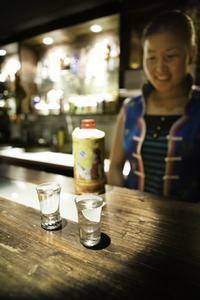 The bar serves a standard set of beers (starting at 30 yuan) and cocktails (30-50 yuan), but those looking for a truly authentic Mongolian experience should try the "Menggu Jiu" (Sm 60 yuan; Lg 160 yuan), a sweet shot of fermented mare’s milk and baijiu that goes straight to the head. On Fridays, throat-singing performers liven up the crowd, but on any night, you can look forward to soothing folk music and enjoyable company. Contact: 66 Guo Ji Xin Gan Xian, Block A, Unit 807.